Forster, who had been an undergraduate (and member of the Apostles) at King’s College, Cambridge, returned to the college as an Honorary Fellow from 1946. 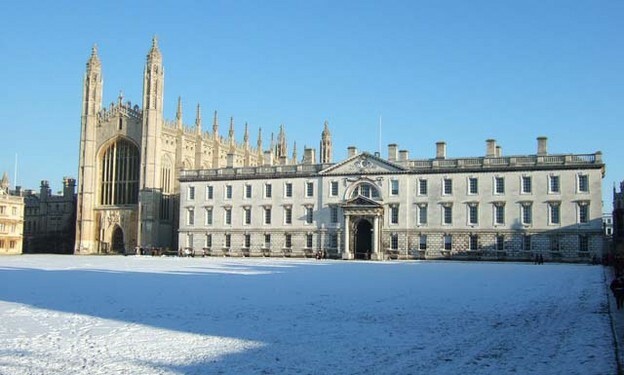 A familiar if unobtrusive figure around the Wilkins’ Building and the courts, it was his habit at the beginning of term to invite the handful of undergraduate King’s men reading English to his rooms for tea and conversation. Among the handful reading English in 1954 was a freshman named John Dixon Hunt. As Hunt recalls it, Forster told the group that while he was shy and tended to look at the ground when he walked, they must not hesitate to address him by name if they wished to speak with him at any time. Taking him at his word, Hunt approached “Morgan” later in the term in order to write a short piece about him for a Swedish newspaper. The following year Hunt, like many at the time, became intrigued by the evocation of Cavafy in Lawrence Durrell’s Alexandria Quartet, and resolved to read the poems in the original. He spoke to Forster about the possibility of studying modern Greek. Forster’s generous response to Hunt’s interest in the poet was to lend him, among other things, the Valassopoulo translations, most of which were still unpublished. The young scholar made good use of them, reading them against Mavrogordato’s collection and the French versions of Théodore Griva as he set out to augment the classical Greek he’d learned at Bristol Grammar School. By June of 1957 he had written a concise and perspicuous appreciation of Cavafy’s work (reproduced below; click to read a full-size PDF version) for Granta, then the university’s undergraduate magazine. Quotations in the essay show that Hunt had also read Bowra’s essay “Constantine Cavafy and the Greek Past” from The Creative Experiment as well as Edmond Jaloux’s prefatory study to Griva’s translations. Many readers will know John Dixon Hunt as an internationally eminent historian and theorist of landscape, gardens, and placemaking and as a longtime professor at Penn. He began his academic career, however, as a literary scholar and maintains a lively interest in poetry. I’d like to thank him for sharing this personal link to Forster and to Cavafy and allowing us to overhear the “great conversation” as it passes from one speaker to the next. In a 1951 article, reprinted in Two Cheers for Democracy, Forster said of Valassopoulo, who was born in Alexandria but studied in England, that of all the people who had tried to translate Cavafy, he was “most to his taste.” “He had the advantage,” Forster went on, “of working with the poet and he has brought much magic across; Cavafy is largely magic.” Even as an undergraduate, Hunt clearly shared this opinion. Besides, like Forster and Hunt, Valassopoulo had been a Cambridge man, and Mavrogordato was a professor at that other place. 1. The Hogarth Press did, however, publish the first collection of English translations of Cavafy, by John Mavrogordato, in 1951. This year marks the sesquicentennial of the birth of Constantine P. Cavafy, poet of the Greek diaspora and important, if idiosyncratic, early exponent of modernism. These commentaries begin with a brief overview of Cavafy's reception and English translation history. Later in the series I’ve invited two other poet-translators, Murat Nemet-Nejat and George Economou, to ponder what is distinctive about Cavafy’s poems that survives translation—his “tone of voice,” as Auden proposed; a “sensibility,” as Gerald Stern amended that formulation; an attitude of “resignation” as Peter Bien had it, or something else entirely. First, though, I want to share a surprising Penn link in the Cambridge-Cavafy connection. The series concludes with an interview with George Economou on the experience of preparing his Complete Plus volume of Cavafy translations, due out from Shearsman this spring. Randall Couch edited and translated Madwomen: The Locas mujeres Poems of Gabriela Mistral (Chicago, 2008) which won the biennial Popescu Prize for Poetry Translation (Poetry Society, UK) and was one of two finalists for the PEN Award for Poetry in Translation. His own poems have appeared in numerous journals and anthologies, and he has twice been awarded fellowships by the Pennsylvania Council on the Arts. He serves on the professional staff at Penn and teaches poetry and poetics at Arcadia University.